I’m in Las Vegas for FreedomFest, which is sort of like summer camp for libertarians, small-government conservatives, and others who don’t like a bloated and intrusive state. I’ll be talking about tax reform, the sharing economy, and strategies to constrain big government. 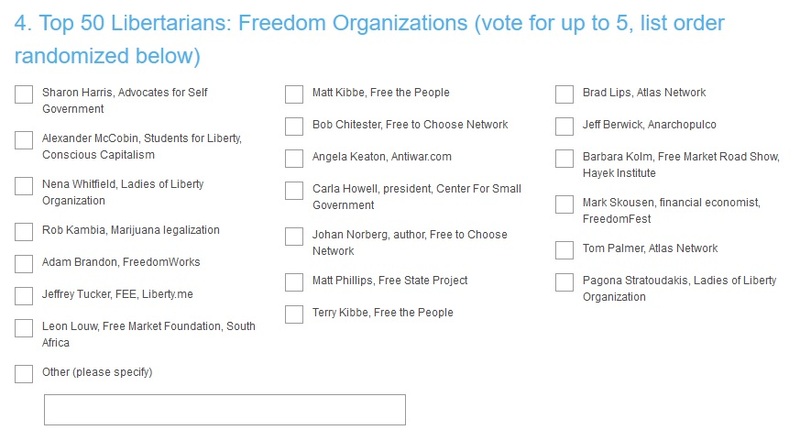 One of the features of this 10th-anniversary meeting of FreedomFest is that the world’s top-100 libertarians will be feted. 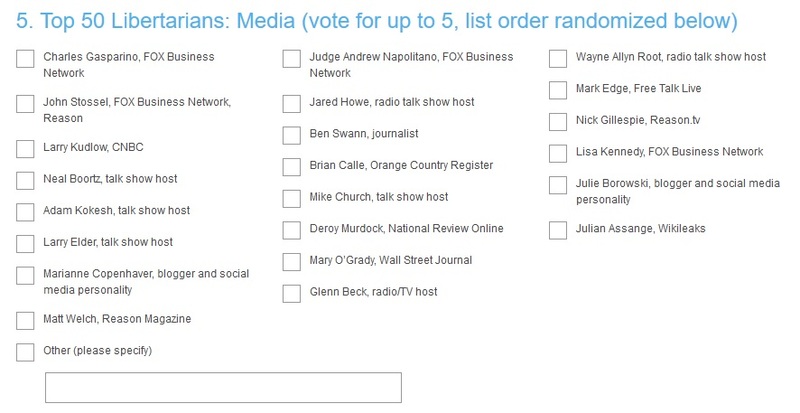 You can see the entire list at NewsMax, but here’s the top 10. A very impressive collection. 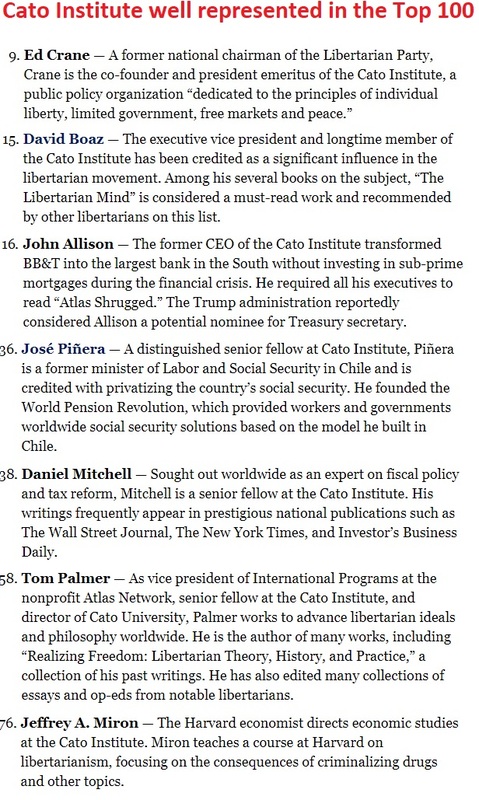 You’ll notice that Cato’s founder and former president is in the Top 10, but he’s not the only representative from the organization. The Cato Institute is justly recognized for being a principled and effective organization. So it’s no surprise that several of us are listed in the Top 100. 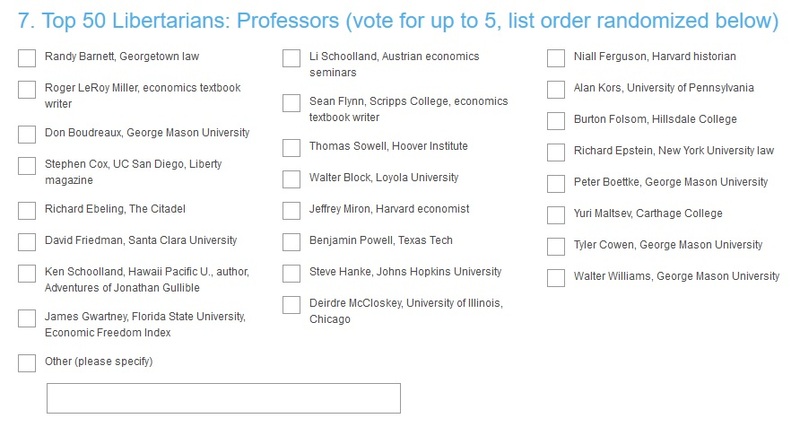 I’m honored to be on the list, though I wonder if I’m there because I’m noisy rather than competent. That being said, given the expansion of government under both Bush and Obama, I guess nobody would be on the list if it was based on achievements. We obviously need to do a better job as a movement. 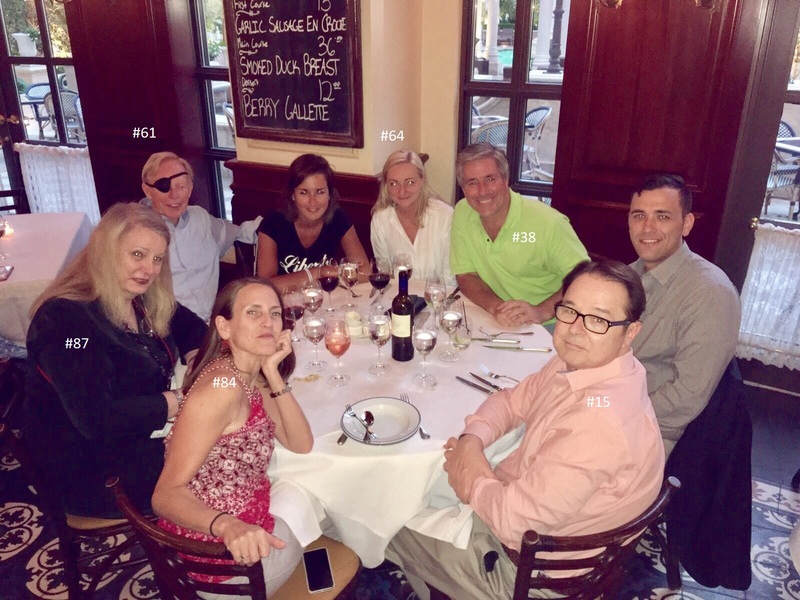 Here’s a photo from a casual dinner last night that included David Boaz (#15), Richard Rahn (#61), Barbara Kolm (#64), Veronique de Rugy (#84), and Deirdre McCloskey (#87). And yours truly (#38), of course. A rogue’s gallery of dissidents, for sure. Let’s close with some libertarian humor, courtesy of a future Top-100 libertarian who also is in Vegas for FreedomFest. 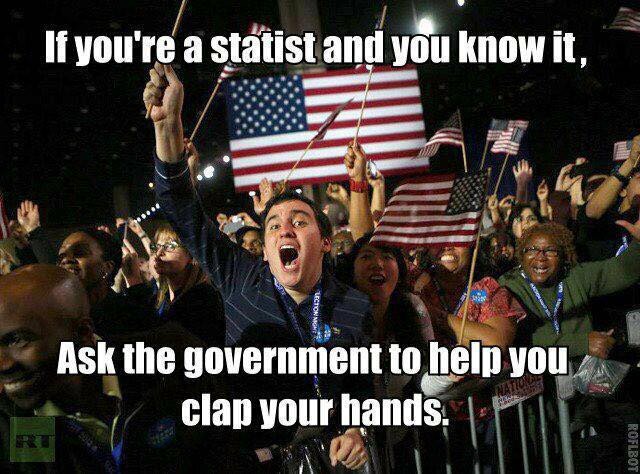 I’ll have to add this to my collection of pro-and-con libertarian humor. I sometimes feel guilty when commenting on Paul Krugman’s work. In part, this is because I don’t want to give him any additional attention, but mostly it’s because it’s too easy. Like shooting fish in a barrel. His advocacy of Keynesian economics, for instance, makes him a very easy target. And it’s always amusing to cite his words when exposing horror stories about the U.K.’s government-run healthcare system. That being said, I feel obliged to write about Krugman when he attacks me or the Cato Institute. He bizarrely claimed that California’s 46th-worst job performance among states somehow was proof that I was wrong to criticize a big tax hike. He incorrectly asserted that Cato supported the laws and policies that were in place before the financial crisis, and compounded that mistake by arguing that the financial crisis was proof that free-market policies (which didn’t exist) don’t work. Now he’s attacked Cato again and he looks like an even bigger fool. Here’s some of what he wrote on May 15. David Glasner has an interesting post about how the Cato Institute suppressed an old paper of his, refusing either to publish it or release it for publication elsewhere, not for a few months, but for decades. What Glasner may not know or recall is that Cato has a long-standing habit of trying to send inconvenient history down the memory hole. When I first read that, I wondered why this was a bad thing. After all, should Cato be obliged to publish articles if we don’t fully agree with them? But perhaps we had made some sort of commitment and were guilty of reneging. That certainly wouldn’t reflect well on us. So was Cato indeed guilty of spiking a paper we had promised to publish? Since Krugman wrote his attack on Cato before Glasner wrote his correction, one presumably could forgive Krugman for an honest mistake. After all, surely he would immediately correct his column, right? On May 19, Jonathan Adler wrote about Krugman’s unseemly behavior in the Washington Post. Krugman’s charge is false… As Glasner recounts in an update to the post that Krugman cited, the initial allegation was based upon a misunderstanding. Cato had not sought to suppress Glasner’s paper. Indeed, Cato had offered to publish it, albeit not as quickly as either Cato or Glasner had hoped. Once this was cleared up, Glasner forthrightly acknowledged the error. “Evidently, my recollection was faulty,” Glasner wrote. Krugman, however, has yet to update his post. Wow. That doesn’t look good for Krugman. But perhaps Adler’s comments had an impact because Krugman did add an update to his post. In an amazing bit of chutzpah, however, he said it didn’t matter. Glasner has retracted, saying he got his facts wrong. Unfortunate. It has no bearing on what I wrote, however. I can understand that it’s no fun to admit mistakes. I’ve had to do it myself. More than once. But you own up to errors because it’s the right thing to do. Ethical behavior, however, is apparently not necessary if you’re Paul Krugman. By the way, Krugman also attacked Cato in his column for supposedly trying to “pretend that they had never used the term privatization” when writing about Social Security personal accounts. I’m not sure why this is supposed to be damning. All groups try to come up with terms and phrases that work best when trying to advocate particular policies. So if Cato people decided to write about Social Security personal accounts instead of Social Security private accounts, the only crime we were guilty of is…gasp…marketing. P.S. I’ve had some fun over the years by pointing out that Paul Krugman has butchered numbers when writing about fiscal policy in nations such as France, Estonia, Germany, and the United Kingdom. P.P.S. In addition to defending Cato, I’ve also had to explain why Krugman was being disingenuous when he attacked the Heritage Foundation. Having dealt with queries about whether I hate Republicans and whether my views have changed on anything, the newest edition of “Question of the Week” asks for my opinion about Senator DeMint moving over to become President of the Heritage Foundation. Variants of this question came from several people, perhaps because folks know that I spent more than 15 years working for Heritage. The short answer is that I think DeMint’s move generally is a good thing. But first, the bad news. It is unfortunate that Senator DeMint no longer will be in the Senate. We need as many “Tea Party” lawmakers as possible since they are willing to fight for small government even when it means causing friction with establishment-oriented, go-along-to-get-along Republicans. But DeMint’s departure won’t be too painful if Governor Haley of South Carolina appoints an equally strong advocate of small government to replace him. Moreover, Senator DeMint no longer is a lone voice for liberty. There are now some very strong defenders of small government in the Senate, including Rand Paul, Marco Rubio, Mike Lee, Ron Johnson, and (beginning in January) Ted Cruz. You can get a pretty good idea of which Senators fight for freedom, coincidentally, by looking at the Heritage Action for America vote rating. So hopefully Senator DeMint won’t be missed too much. But what about the implications for Heritage? But I disagree with Josh’s concern. 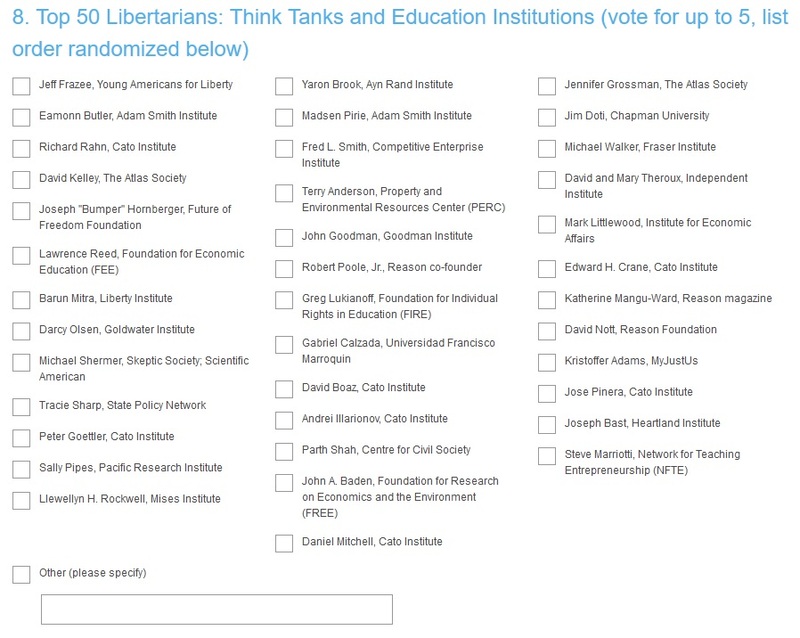 Think tanks fill various niches in the battle of ideas. Heritage (even when I disagree with the organization) has an unparalleled outreach program to folks on Capitol Hill and it also has a very impressive capacity to bring information to the grassroots. Those are good features. In other words, think tanks shouldn’t all fit the same mold, featuring wonky guys with thick glasses publishing 50-page papers. Nothing wrong with that, of course, particularly since I’m a bit of a wonk myself. 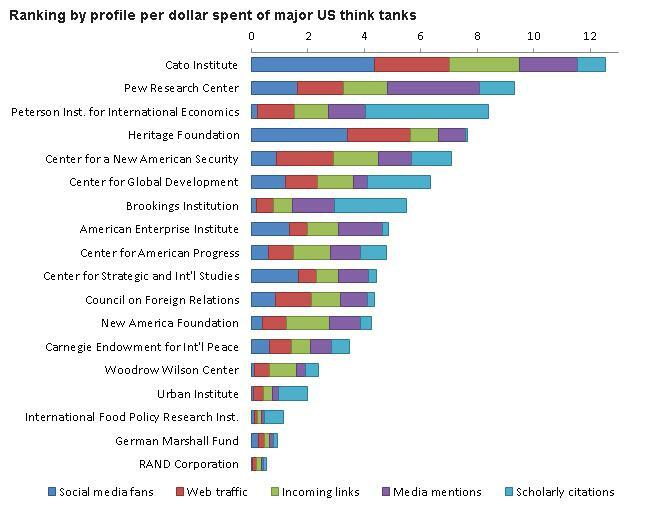 But just as diversity among governments is a good thing, so is diversity among think tanks. What matters to me is whether DeMint will guide Heritage in the right direction. At times in recent history, it seems Heritage lost sight of its Reaganite roots. The organization, for instance, got some unfavorable publicity for supporting healthcare mandates (for friends of Heritage, this leftist video is very painful to watch). The Heritage Foundation also was far too timid last decade about criticizing Bush’s reckless record of excessive federal spending. Given DeMint’s principled opposition to statism on Capitol Hill, I suspect he will lead the way in restoring Heritage’s bona fides as a proponent of small government. That’s very good news, especially at a time when congressional Republicans seem to be losing their nerve. It’s also worth noting that DeMint has some libertarian sympathies, as Nick Gillespie explains for Reason. 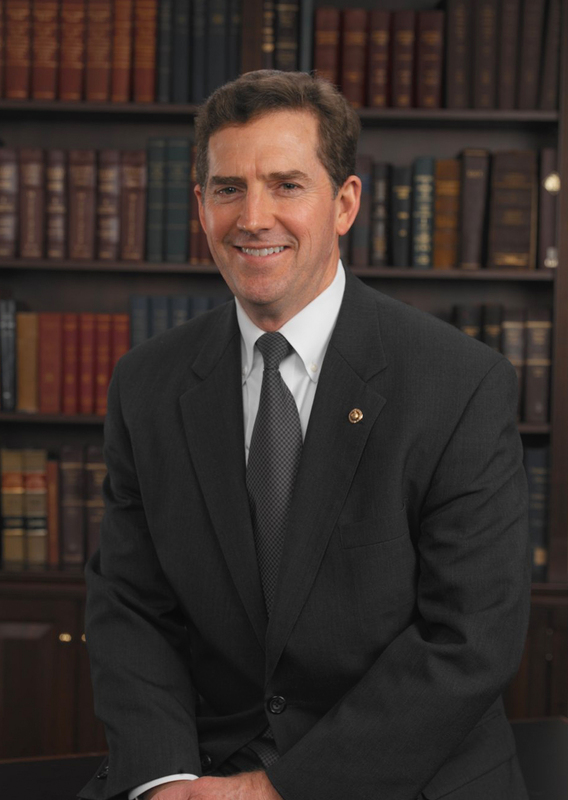 All things considered, Senator Jim DeMint seems like a very solid pick for the top job at the Heritage Foundation. Particularly since he presumably will be an effective fundraiser, which is one of the main jobs for the leader of a non-profit organization. And since this post is about think tanks, let me take this opportunity to say some nice things about my employer. More specifically, I want to congratulate Michael Cannon, one of my colleagues at the Cato Institute. He was just featured in the New Republic, a left-wing magazine, as the leading opponents of Obamacare. Here’s a bit of what they wrote about him. Can one very determined libertarian and one very distorted version of history keep millions of people from getting health insurance? We’re about to find out. The determined libertarian is Michael Cannon of the Cato Institute. He was among the most vocal opponents of the Affordable Care Act, going back to the time when it was still a glint in the eyes of Ted Kennedy. The idea of universal coverage is so antithetical to Cannon’s principles that he actually started an “Anti-Universal Coverage Club.” Once the law passed and took on the moniker “Obamacare,” Cannon became a leading advocate for its repeal. And since he understood the law might survive both the courts and the 2012 elections, as it eventually did, he also made the case that states should avoid complicity in its implementation—and, if possible, actively thwart it. He made that case in his writing and speeches, sometimes directly to the officials with responsibility for implementing the law. …And no single individual has done more to make the case for state resistance to Obamacare than Cannon. Kudos to Michael. You know you’re doing a good job when your enemies are attacking you. Michael’s also done great work on entitlement reform, and you’ll recognize his mug if you watch my videos on Medicare and Medicaid reform. At the risk of bragging, Cato is filled with people who make a difference. I’ve noted how Cato organized the first attack against Obama’s faux stimulus when others were sitting on their hands. And it was Cato scholars who helped rejuvenate the constitutional case for limited government. So I’m glad that Heritage is moving in the right direction, and it was great working there for many years, but there shouldn’t be any confusion about the best think tank in Washington. I get criticized all the time, usually because of my support for limited government (though sometimes because people think I’m not sufficiently radical). Sometimes I even get attacked because I cite someone else’s work, as happened when a bunch of Keynesians went after me for posting some data on Reaganomics vs. Obamanomics put together by Richard Rahn. Just last week, though, I was attacked from a completely different perspective. Some guy named Stan Sewitch, in an article for the San Diego Daily Transcript, questioned my motives rather than my views. He started out with an innocuous description of a speech I gave. These days, the harbingers of doom no longer include hippies or even youth. The “protest” movement that may be growing in our country now is known for its natty fashion sense and belief in free markets… It winds its way to the offices of lobbyists and politicians. It acts a great deal behind the scenes, and uses the educated, articulate voices of “think tank” gurus to make the points. Daniel Mitchell is a senior fellow at the Cato Institute, a nonprofit economics and policy research organization that promotes “libertarian” philosophies, i.e., small government, free markets and individual rights. I heard him speak recently about how the United States could avoid “becoming the next Greece.” As he described the lengthening list of ills that our country has inflicted upon itself, Mitchell acknowledged that neither party has a consistent track record of doing the “right thing” to keep our gross domestic product growing faster than our government spending rate. …In that sense, the Cato Institute does seem to represent a nonpartisan view of our national and international state of affairs. Since I think America faces a very grim fiscal future in the absence of entitlement reform, and since I also blame Bush as much as I blame Obama, I can’t quibble with anything he wrote. But then he starts to speculate about my (grossly inadequate) salary. But as he continued to describe the litany of calamity that will befall us under current conditions, I asked myself, “Gee, I wonder who pays Mitchell’s salary? Can’t be cheap.” So I did a little looking on the Web, and I found the 2011 annual report for the Cato Institute. They brought in about $33 million in revenue last year, spent about $22 million and showed net assets of $63 million. Well, it looks like they practice what they preach, spending less than they earn. And they earn a lot. Where’s he going with this, I wonder. But I suppose I could have guessed that he would focus on rich people and corporations. The Cato Institute doesn’t list its individual benefactors or corporations that provide the funding, but their board of directors includes David and Charles Koch. The Kochs founded the Cato Institute and have contributed millions to it. Combined, the Koch brothers are worth roughly $50 billion. Their company, Koch Industries, generates about $100 billion in annual revenue and is the second-largest private company in the United States. 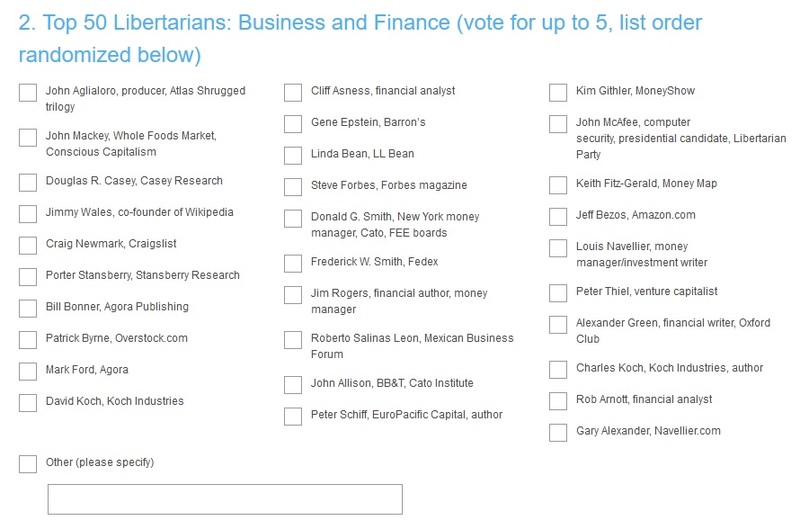 Other like-minded, wealthy individuals undoubtedly make up the financial support for the Cato Institute, along with corporations, the sale of Cato Institute books and the speaking fees that Cato scholars receive for their expert punditry. My Sewitch obviously doesn’t know that Cato hasn’t received support from the Kochs in recent years, much less that the Cato Board and the Koch brothers had a big fight about the future of Cato, but that’s an understandable mistake since the average person would have no reason to follow a squabble inside the libertarian movement. But his point is generically true. Occasional large contributions from wealthy people can play a non-trivial role in the budget of any non-profit group. So what’s the point? Well, here’s where he gets to the part about my motives. Whether or not one subscribes to the shiny and attractive ideals of small government, free markets and individual liberty, one has to follow the money, the economics of any given viewpoint to be able to evaluate the veracity of the opinion. The money behind Mitchell’s capacity to publicly opine comes from business people who want to affect policy at the federal and state level toward outcomes that they believe are in the collective best interests. It also doesn’t hurt that those same people benefit personally and financially from the promoted policies and research results that the Cato Institute generates. …So if someone is earning their living by preaching, whether for God or free markets, I have to find out who’s paying them to tell me this stuff, and I immediately discount the value of the sermon by 84 percent. Gee, I guess I should be happy that my opinions are worth 16 percent rather than zero. But now for my serious point. Washington is filled with people who say things, write things, and do things solely because they’re getting paid. I often write about the sleazy behavior of such people, particularly Republicans who do the wrong thing just to fatten their bank accounts. So I can’t complain when someone questions my motives. Everyone in Washington should be viewed with suspicion. It is, after all, a pervasively corrupt town. That being said, I invite the world to comb through everything I’ve ever done, everything I’ve ever said, and everything I’ve ever written to find the slightest shred of evidence that I am motivated by anything other than a principled belief in liberty. Do I get paid to do all these things? Of course, which is why I consider myself to be a very lucky person. I’m getting a salary to do what I would be doing anyhow. And if we count the non-pecuniary satisfaction of fighting for liberty, I’m one of the richest people in DC. You can’t deposit non-pecuniary satisfaction in a bank, to be sure, but I wouldn’t trade places with any of the multimillionaire lobbyists. That would be like watching It’s a Wonderful Life and wanting to be like Mr. Potter instead of George Bailey. 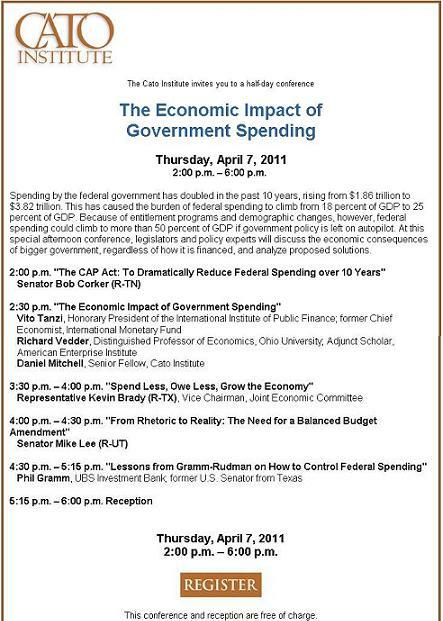 On April 7, the Cato Institute will be hosting an important conference on the economic implications of big government. We have a great line-up of speakers, including economists who will look at the evidence and lawmakers who will discuss different ways of restraining the growth of the public sector. This post is largely for readers in the DC area, but anybody who is sufficiently concerned about America’s fiscal future is welcome to attend – even if it requires a special trip to Washington. Register at this link, which also has information for those that can’t attend but would like to watch online.